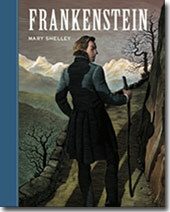 Mary Shelley's groundbreaking classic--begun as a ghost story for friends--is a potent blend of science fiction and horror that has inspired countless movie and other adaptations. Nothing, however, equals the depth and beauty of Shelley's original, which emains as relevant as ever. In his arrogance, Dr. Victor Frankenstein dreams of discovering the very secret of life...and he succeeds, bringing a new creature into existence. But should man ever play God--and if he does, what does he owe his creation?